I finished the National Novel Writing Contest today, but I think it almost cost me my sanity. You see, unlike most people, I don’t handle deadlines, confrontation, or anything remotely stressful, well at all. Phone calls annoy me (the first one or two), and then terrify me (all the rest), especially if they come more often than, say, once a week. I’m serious. And if I have to make a phone call, unless it’s to my wife, I put it off, stress over it, and let the workday end so that I can put it off until tomorrow or whenever. Next week would be better. Next year would be ideal. I am growing increasingly anthropophobic as I get older. This does not bode well for my social future. I’m glad I’m already married. It would be almost impossible for me to start dating again. Phone calls aren’t the only thing that stress me. According to my wife, anything that resembles “work” has the same effect. If I consider something a job, or work, instead of a hobby, or fun, or relaxing — it doesn’t matter what it is — I start to stress over it unnecessarily. This doesn’t mean I can’t do work. I just have to encapsulate it properly ahead of time so that it’s an adventure — not just a mundane “job”. So when NaNoWriMo came along, I thought “sure, I can do that” when I should have identified it as a contest, a confrontation, or “work”. I did finish it, even though my daily word count ended up being about half of my average, because of the constant e-mail and forum nagging, and the pressure to write-write-write. 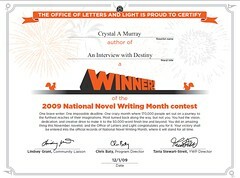 The contest is clearly for newer or younger authors who are learning to prioritize their time. It demonstrates that writing a novel (or technically a novella) of 50,000 words is completely possible in the one-month time-frame they give you. But for those of us who can already write effectively, the “contest fever” is a distraction from what we really should be doing, which is writing. I should have recognized it for what it was and either avoided it, or signed up and ignored the nagging spam, because I’m going to write anyway, and 50k words is a two-week thing for me, if that. But I didn’t. I signed up for the forums and attended some write-ins, and listened to the constant e-mail spam. I allowed myself to get sucked in to the hype and the fever, and it just about killed me. If I had just done the thing without the hype, I would have been fine. For next time, I’ll know how to handle it. Like Yoda said to Luke Skywalker: “Do or do not. There is no try.” I will choose to do a thing, or not do it, but when I “try”, somehow it ends up feeling like “work”, and for me, that’s a recipe for disaster.